The 2019 Kia Stinger has been making a lot of noise lately. It's become one of the hottest sports sedans in America. Although European models such as the BMW 3-Series have traditionally dominated the segment, there's no overlooking the new Kia Stinger's strong value. You'll enjoy its great warranty package and entertaining level of performance. Sporty exterior styling also helps this sedan to measure up well against the competition. Let's find out if you should spend your money on the new Stinger. Amazingly, Kia has transformed the 2019 model into an even better bang for the buck. Blind-spot monitoring with rear cross-traffic alert has been added as a standard feature. Meanwhile, some of the upper trims now come loaded with a greater number of luxury features. When stacked against today's other midsize sports sedans, the 2019 Kia Stinger proves to be a superior value. Every buyer will benefit from the Stinger's 100,000-mile powertrain warranty. Prices start at slightly more than $32,000 for the base model. You will also enjoy several standard features. Some of the key highlights include a touch-screen display with smartphone integration, satellite radio, leather upholstery, and parking sensors. While a more powerful engine is available, most drivers will find the base engine to be quite fun. This turbocharged four-cylinder develops an enjoyable 255 horsepower and 260 pound-feet of torque. When accelerating from a stop, the 2019 Kia Stinger can hit 60 mph in 6.1 seconds. Not only is the four-cylinder Stinger responsive, but it's also easy on gas. According to the latest EPA ratings, you can anticipate getting just shy of 30 mpg on the highway. In the past, automatic transmissions were not very fun. They tended to take away from a car's performance capabilities. The Stinger's eight-speed automatic proves that's no longer the case. Whether you're accelerating from a red light or casually cruising along the interstate, you'll always be in the ideal gear. Because the transmission is so precise, most drivers will never use its manual mode. Simply step on the accelerator and the Stinger responds immediately. The Stinger's turbocharged V6 engine is a must for true thrill seekers. Kia rates it to kick out a competitive 365 horsepower and 376 pound-feet of torque. It's power delivery is similar to that of a traditional V8 engine. With a 0-60 time of around 4.5 seconds, the V6-powered Stinger can easily keep pace with a Ford Mustang GT. While you can expect the more powerful Stinger to be less efficient, it's not terribly bad on gas. Drivers should be able to get up to 25 mpg on the open highway. When behind the wheel of the 2019 Kia Stinger, you're bound to crack a smile. It drives like a true sports sedan. Kia nearly perfected the Stinger's steering feel. Drivers will experience a solid connection to the road. Activating the sport mode gives you additional feedback. Even the base Stinger delivers tight handling on twisty roads. However, adaptive suspension dampers help the GT model to deliver an especially athletic performance. The 2019 Kia Stinger is a work of art. A fastback roof and sculpted body lines help give it a remarkably sleek look. This dynamic sports sedan definitely causes people to turn their head. Dual chrome exhaust tips come standard. While the base Stinger is an eye-catcher, the GT model looks a bit angrier. It adorns a more aggressive front bumper and a flashier set of 19-inch performance wheels. Some of the available Stinger colors include HiChroma Red, Micro Blue, and Panthera Metal. If you don't want to sacrifice any practicality, the 2019 Kia Stinger deserves a serious look. It's airy cabin can accommodate a family of five. Power-adjustable sports seats help keep you snug on long drives. Drivers will also be intrigued by the Stinger's hatchback design. The extra cargo space makes the Stinger a great substitute for a two-door sports car. All-wheel drive and a hands-free trunk are optional. Although the 2019 Kia Stinger may not have the status of a Mercedes-Benz sports sedan, it's overall quality is not too far behind. Car reviewers give the Stinger high marks for its overall fit and finish. There's definitely not a lot of wind noise entering the cabin. This is a testament to the car's impressive craftsmanship. Even the less expensive base Stinger has a leather-lined interior. This year, all versions of the Stinger come standard with blind-spot detection. This feature gives you more assurance of busy highways. Standard rear cross-traffic alert also helps with parking. Upper trims benefit from a more advanced safety package, which comes with driving aids such as forward collision mitigation and adaptive cruise control. The 2019 Kia Stinger has a nice infotainment system. You can comfortably operate the interface without taking your eyes off the road. Its touch-screen display allows you to quickly select mobile apps. Music fans should also considering stepping up to the 15-speaker Harman Kardon sound system. Testers compliment the system on its great sound reproduction. The average family will have no concerns about the Stinger's roominess. On the other hand, tall folks riding in the back may desire just a bit more toe space. You should also consider the Stinger's low roof, which will require some passengers to duck their head upon stepping inside. Before deciding on the new 2019 Kia Stinger, allow your family to take a ride. In the past, virtually all of the premier sports sedans offered a manual transmission. Sadly, things have took a dramatic turn in recent years. Like so many of today's other sports sedans, the 2019 Kia Stinger does not offer a stick shift. This will disappoint the folks who hate the thought of a computer doing all of the work. If you can't imagine driving with without a manual transmission, take a look at the 2019 Audi A4. Some people may desire a more fuel-efficient sports sedan. While the new Stinger can't surpass 29 mpg, the Audi A4 can return up to 37 mpg. Keep in mind that even the Stinger's base engine is tuned to use high octane fuel. As of now, the Kia Stinger has yet to be officially crashed tested by the NHTSA and the IIHS. While the Stinger's advanced driving aids are effective, knowing its crash scores would give drivers a greater peace of mind. It comes as no surprise that the Stinger's rearward visibility is a bit limited. This problem mainly stems from the sedan's sleek design. Kia has helped remedy the Stinger's visibility issues by adding blind-spot monitoring with rear cross-traffic alert. Some people will be cross-shopping the 2019 Kia Stinger with the BMW 3-Series. Although the BMW 3-Series is fun and luxurious, it can't match the Stinger's value. Everyone can reap the benefits of the Stinger's superior warranty package. Some drivers will also prefer the Stinger's powerful exterior styling. You may be considering the Mercedes-Benz C-Class as well. While the Mercedes-Benz C-Class is a great sedan, it costs more money than the new Kia Stinger. It also does not provide as much legroom as the Stinger. The new Alfa Romeo Giulia is another sports sedan worth test driving. However, questionable long-term reliability will cause some some people to think twice about buying it. 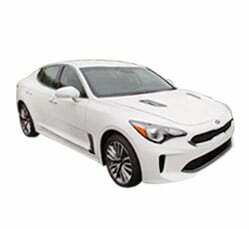 The 2019 Kia Stinger is an excellent value that ranks high in several categories. While the Stinger's breathtaking styling is a big draw, it also promises to deliver a standout performance on the road. A practical hatchback design adds to this sports sedan's appeal. Available all-wheel drive is another highlight. On the downside, driving enthusiasts can't get the Stinger with a manual transmission.